In the myths of old, they are beings of glorious purpose, noble and magnificent in deed and character. Their scales, imbued with the light of the heavens, glisten and gleam in seas and storms, the stage for grand displays of power. The ancients spoke of these sacred creatures, which reigned over the earth spreading blessings throughout the land. As time passed and legends faded, they hid and were nearly forgotten. Relics of a distant era, buried under dust — until a delicate touch brought them back to life. In the morning of a new millennium, Shen Yun Performing Arts has awakened the sleeping myths of old into the present. And the result is nothing short of splendid. Established in 2006, the New York-based performing arts group has grown from a single company to five — each complete with a dance troupe, singers and live orchestra — that now tours annually around the world. Its performance is grounded in classical Chinese dance, an art form almost as old as China itself. Over thirteen years, five continents have seen nearly 3,000 successful shows performed in sold-out venues such as Lincoln Center in New York, Kennedy Center in Washington DC and Palais de Congrès in Paris, among others. What started as a wish to revive traditional Chinese culture has exploded into a global sensation, earning the praise and admiration of art lovers from all walks of life. True art does not need translation — its message reaches beyond the boundaries of language and speaks directly to the soul. The very best of China’s culture, spanning 5,000 years, is skillfully woven into original dance pieces and compositions made by Shen Yun’s in-house choreographers and composers. Some are portraits of its greatest heroes — the strategist Zhuge Liang, the heroine Mulan. Others paint scenes from folklore and fantasy — the exploits of the Monkey King, the halls of the Dragon King’s palace. Many are simply expressions of grace, beauty and strength; poetry given physical form in gorgeous group dances brimming with masterful choreography. “In the soft moments, the quiet moments and the energetic moments, you are really transported — it’s really beautiful,” said Canadian celebrity chef Christine Cushing after seeing the performance in Toronto. 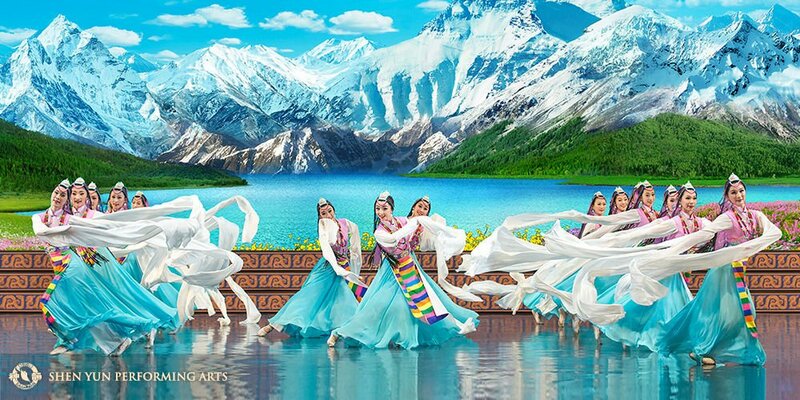 From the vast steppes of Mongolia to the Himalayan heights, and from the battleships of ancient warriors to the gardens of an imperial court, each program by Shen Yun is a colorful leaf in the ever-growing tree of history. Though each piece stands alone, all are part of the whole — a colorful canopy nurtured from the seeds of a breathtaking past. Perhaps what touches audiences most is the message behind it all. There is an element of sincerity in the entire production. From the expressions on each dancer’s face to the lilting notes of each singer’s song, every sight, sound and sensation intertwines as a harmonious whole. There is a real sense that the audience is not only seeing the show, but experiencing the lives of its characters as well. This is especially poignant in pieces that take place in contemporary China, illustrating issues involving human rights and the persecution of Falun Gong, a spiritual meditation discipline. The combination of traditional morality in a modern-day setting outlines the enduring essence of ancient beliefs and illustrates the strength they give for overcoming hardships in the present day. “I could reach into it and cross the divides, and reach into that spirituality,” said Wendell Mottley, Olympic medalist and former finance minister of Trinidad and Tobago, after seeing Shen Yun in Lincoln Center. Perhaps the true magic of Shen Yun lies in the fact that it exists at all. In our fast-paced, frantic world, it is hard to find a time to enjoy the scenery. The serenity of the ancients and their words of wisdom have precious few chances to grace us with their presence. And yet Shen Yun has done all of that, and more, in a single show. We are taken across the meadows and over forests, past forbidding peaks and mysterious depths. We laugh with colorful characters of old, stand strong against our enemies and marvel at the endless beauty of life, free and unfettered. The ancient Chinese referred to themselves as Children of the Dragon. From their celestial ancestor, they learned to live noble, dignified lives of virtue — lessons that they passed on to their descendants. In a sense, we are all successors of ancient legends. Our roots originate from different worlds, but the voices of the past still rest within our souls. Shen Yun will be performing at Pikes Peak Center for the Performing Arts, March 19 and 20, 2018. Find tickets and more information at www.shenyun.com/cosprings.